The sunsets are one of the essential attractions of Ibiza when you are there for holidays. When the sun sets different places of the island acquire that “Je ne sais quoi” that is worth contemplating. No matter what time of year you visit the island, its charm will conquer you 365 days a year. It stands out in summer for its spectacular beaches and paradisiacal coves and, in winter, we leave place to activities led by the tranquillity of the environment. See how the landscape and the sea are impregnated with that relaxing orange colour that is one of the great wonders of life. So, either near the sea or on the terraces of our hotels in Ibiza … enjoy every sunset! What are the best viewpoints of Ibiza? Ibiza is one of these islands that you never get tired of, you never have enough and you always want more. The main activities that can be done in the city of Ibiza include enjoying a magnificent beach and cove accessible by boat. However, all this can be enjoyed much more with the alternative plans we have for you. Here we propose a list of the 5 most prized Ibiza viewpoints on the island for a sunset. This well-known viewpoint was named in remembrance of the king of Aragon at the time when the islands of Ibiza and Formentera became part of the crown of Aragon in 1235, it is also called the viewpoint of Dalt Vila. Located in the square of the Cathedral of Ibiza and only 25 minutes from our Insotel Club Tarida Playa, it is the perfect place to rest after having travelled all over the city. From this viewpoint you can see how the night falls contemplating the views of the port and the sea. The Torre des Savinar or Torre des Cap des Jueu is the ideal place if you are looking for a spectacular place surrounded by nature. If so … this is your viewpoint! There is no doubt, it is one of the best viewpoints of Ibiza, it is located in the heart of the Cala d’Hort Natural Reserve, and so you cannot miss the best views and coves of Ibiza. Although the tower itself is closed, the viewpoint is easily accessible, so you can easily climb and enjoy a spectacular sunset. You can also contemplate in the distance the islets Vedrà or Es Vedrà and Es Vedranell, located just 20 minutes from our hotel in Ibiza. It is one of the most famous locations in which to contemplate the sunset, is full of chill out areas perfect to watch the sun go down with a cocktail in hand. 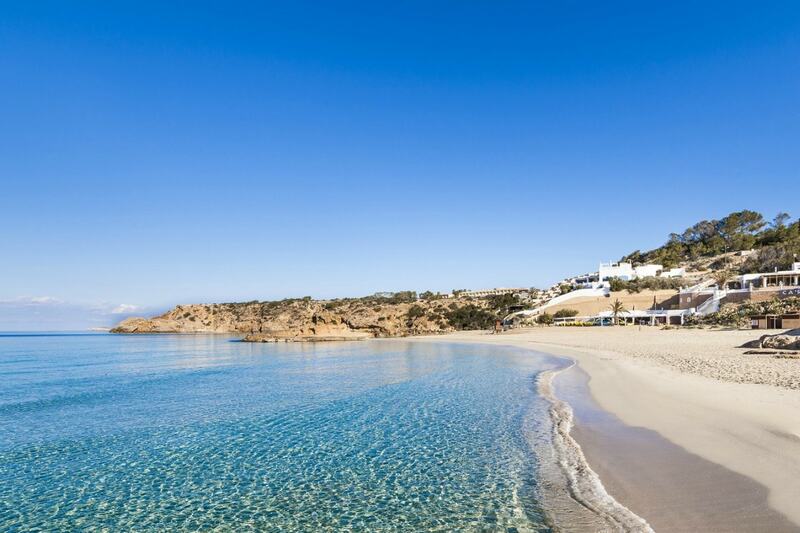 In addition, it is located just 20 minutes by car from our hotel Insotel Tarida Beach Sensatori Resort. Do you want a romantic sunset with your partner? Cap Negret without a doubt, is the best option. In addition to arriving by car, you can arrive from Sant Antoni by a road connected to Cala Salada, and if you want to improve your travel experience don’t miss this visit for an unforgettable sunset together. Enjoying the incredible views in the most emblematic places of the island is not an odyssey. The Sa Talaia viewpoint, for example, is ten minutes away by car from our hotel Insotel Club Tarida Playa and located in the town of San José, also known as Sant Josep de Sa Talaia. It is the highest point of the island of Ibiza, where you can find the highest mountain of the place. In this beautiful viewpoint you will have a panoramic view of the island and if the day is clear you can see the coast of Ibiza, Mallorca and Formentera. Every city has its charm, but Ibiza is a place with beautiful views of the sea, natural beach, celestial coves and much more. This increases the importance and interest in the best viewpoints of Ibiza. Mirador Puig de Missa is an authentic charm. Although you can get there by car, we recommend that you go up here taking a walk as you will be able to contemplate a beautiful landscape where you will find the Santa Eulalia River and many white houses of Ibiza architecture. If your plan is to visit all the beautiful corners of this enchanting island in a day, pay attention to our recommendations. When it comes time to plan your vacations, you should take into account all the activities you wish to do in Ibiza so that your holidays are as you have dreamed of them. Ibiza or the white island boasts paradisiacal beaches and coves where you can enjoy a few moments of relaxation and a peaceful atmosphere unmatched. However, we recommend you visit the famous walls of Ibiza during the morning and relive through them the culture and history of the city, which are more than 200 years old. You can take advantage of the afternoon to enjoy the best moments of relaxation in the SPA of our hotel in Ibiza. At sunset you can go by car to one of the recommended viewpoints to enjoy panoramic views never seen before. And to end the day enjoying the pleasure of the island, we suggest you to dine at one of the typical dishes of Ibiza, its gastronomy will seduce you! This is our selection of the best viewpoints of Ibiza. We wait for you in our luxury hotels in Ibiza to make your trip to Ibiza an unforgettable experience, are you going to lose it?